The following is the seventh message that we received in Egypt this past March 2012 over Equinox. You can find our other messages on our website at www.alunajoy.com under the "Articles for Personal and Planetary Transformation" link. It might be a good idea to read them in order as each message builds upon the previous one. We are sharing this message here with you just as we received it, in present time, with very little editing. We do this for a very important reason. We know that the messages that we receive are not just for our groups, but are for others as well. The Atlantean/Egyptian Masters and the Star Elders assure me that the message and the corresponding energy will be transmitted to you. So as you read this, you might want to imagine that you are with us. Also, always view the photos on the website that we share, as photos also hold some energy of the sites. It has become quite apparent that there has been a progression of events in our journey, which is not usually the case, but many times we get halfway through the journey before we recognize the patterns. On the first day at Cairo's museum, group member Kelly told me to check in with Sekhmet to see what I get. Sekhmet had never spoken to me in the past, so I thought "Why not. I'll give it another try," and I got a message: "Come back." But the message wasn't to come back to the museum in Cairo. So when we got the chance to go to Karnak and spend nearly an hour with Sekhmet, we discovered that Sekhmet was saying to come back to her temple in Karnak. And Sekhmet gave us that space - not 10 minutes, not 15 minutes, but almost an entire hour in her temple. While we were there, she healed and cleansed us, getting us ready for something: a job maybe. Remember when we were in the temple at Karnak, I said that Sekhmet was giving us something. I couldn't figure out what it was, but it was very clear that we were getting something from her. It wasn't until this morning (after our experience at Edfu) that I figured out what Sekhmet was giving us (and those reading these messages). Yesterday when we were outside the temple at Edfu, I felt Horus very strongly. The feeling was really powerful, and I thought, oh my goodness, this is going to be awesome. Then when we walked up toward the temple, the energy got very quiet and empty. The temple's energy didn't feel empty because there were no tourists; it was because Horus had stepped aside. When we went into the temple, we felt that the energy of old Atlantis (the misused energy of Atlantis) had been buried underneath the temple, and Horus had claimed victory over this dark energy. However, this energy is extremely sneaky. At the time, we didn't notice or feel how much this dark energy was draining us. But when we got back outside of the temple, everyone was completely exhausted - and this was after two days of cruising and taking it easy. At the end of the day, we barely finished our dinner before we all ran off to bed. Our energy level was greatly altered by visiting the Edfu Temple. This morning, just as I woke up, I received the message that Horus had moved aside because Sekhmet told him that we were there to collect some of that mis-qualified energy of Old Atlantis from the temple underneath. If Horus had been there, he would have blocked us from doing that because he protects the temple from such negative energy leaking out. So, without his protection, we absorbed some of that energy. We had been put to work by Sekhmet. The interesting thing is that last year we arranged this pilgrimage in the reverse direction on the Nile compared from this year. Last year we went to the healing temple of Kom Ombo first, and then we went to Edfu. Just like yesterday, when our group went to Edfu, we were drained tremendously. This heavy work we had to do on our own without the help of Sekhmet and the temple of Kom Ombo. This was a great test for us, and it also strengthened us as well. But it was hard. When we got home, it took a long time for us to process, release and transmute this negative energy. Yesterday, when I looked around the dining room table, and I realized that everybody had picked up this negative energy again, I became upset. I thought "Not again." 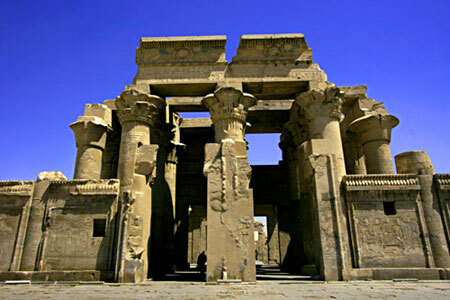 But today we will be going to Kom Ombo, the temple of healing duality. Today we need to proclaim inside of ourselves that because we intend and "say so," we now are going to take the dark, old energy of Atlantis that Sekhmet wanted us to cleanup and give it to the temple at Kom Ombo to be recycled. Kom Ombo temple knows what to do with this negative energy. Interestingly enough, the structural meaning of the Kom Ombu Temple is about understanding the light and the dark and balancing these contrary energies in the wholeness of the center. When we walk into the temple, we will see two altar stones, two Holy of Holies - one on the right and one on the left. It does not matter which one represents the light or which one represents the dark, because I think that the stones are identical. In other words, it doesn't matter which way we work with the altar stones and the energies. But we must work with both alters to heal duality. Each one in the group had received a Rose Quartz Heart at the beginning of the trip, and we had been carrying them in our pockets. I had a calling to bring the rose quartz hearts for the group, which is a healing crystal, on this pilgrimage. We had been carrying them around with us to all the sites that we have visited. Sekhmet had downloaded a healing program into the crystal. Then we took these crystals to Edfu, where they (and we also) absorbed energy. The rose quartz heart crystals carry this energy and are like an energy record of our pilgrimage. When we go into the temple at Kom Ombu, since it is a very open temple, the guards will be able to see everything we do. So don't mediate with your eyes closed unless we get space, and Hatam (our Egyptian guide) gives us the go ahead. We are going to pretend and act like we are tourists. We don't have to do anything externally, outside of ourselves, to accomplish what we need to do. Sekhmet is asking us now to dump the old Atlantean energy that we absorbed at the temple in Edfu. We (and those reading this) are strong and prepared for this task. The old energy would not have been given to us unless we were able and ready to dump it into the temple at Kom Ombu and let that site clear the energy. This is what that site was created to do. So when we dump the old energy while we are at the Kom Ombu Temple, we will want to follow our hearts - each one of us doing what feels right. First we will want to place the heart crystal on each alter on each side of the temple and perhaps then set it in the middle. We are going to have to be sleuths, like undercover agents. Then we will proclaim inside ourselves - in our "I AM" Presence and with the Masters as our witnesses - that we let go of all the energy that we absorbed yesterday and that we allow it to be cleared and purified, because it is not our job to take the old energy home with us. It is important to remain consciously aware that we are now letting go of not only our past-life wounds from Atlantis but also all the old Atlantian energy (incurred by us in the temple) that Sekhmet has requested and trusted us to take care of. Are you ready? We are now warriors for Sekhmet with our lion roar. Let us go. I feel energy around my heart. It is bringing into balance the positive and negative energies. The local guards have given us space. We send love to the guards and the tourists who decided to come on a different day. Those of us who haven't done so, you might want to put your heart crystals on the ground in the center for just a second or two and let them get cleared too, because the crystals are going to hold the charge for the rest of the trip. Let's all stand in the center point, because all of us have collected some old energy from the past that needs clearing here. Horus stepped aside instead of protecting us; he knew that we servers of the Light, and we came here to do a job. The Masters, Guides, and Star Elders gave us a job and put us to work. That's why we call this journey a pilgrimage. Now they are sending us thanks and blessings for being strong enough to shoulder the energy we picked up yesterday, even though we didn't notice it at the time. Actually, it is all part of the divine plan of Horus and the goddess Sekhmet. Thank you, Great Divine Director. Thank you to the "I AM" Presence. Thank you to the Ascended Masters, guides, guardian, and angels, for trusting us with this job. Thank you Jeshua; thank you Mother Mary, Mary Magdalene; all the Seven Rays of the Andean Masters, all the Seven Rays of the Archangels, thank you for bringing us together to do this work. Thank you for trusting us with it, and may our work here activate other groups to do the same work, so the old energy of Atlantis and all the mis-qualified energy can totally and completely be removed from the Seth Temple and recycled. May what we have begun become a tidal wave of energy to clear the earth of its negative, mis-qualified energy for all time, for as far out in the future as the Masters foresee - for future eons and eons and eons. Through all time, space, and dimension, past, present, and future; body, mind, and spirit; seven days a week, 24 hours a day, 365 days a year. May the LIGHT be so strongly anchored that nothing ever again, in all eternity will be able to shake it from its roots. And so it is, because we say so. We are the "I AM" -- That IS who we are. When we intend/invoke/pray in such an explicit, simple manner - when we proclaim the "I AM That I AM" presence -- we are not just slightly motivated; we are giving it our All. And so it is. Post note…. 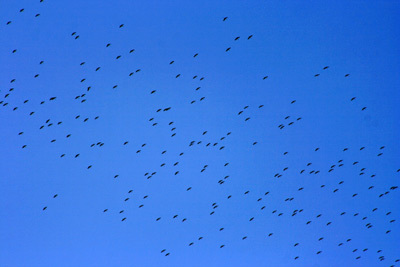 Directly after our work in Kom Ombo, we looked up in the sky and saw thousands of cranes very high up in the air. Oddly they seem to not be moving. Then we blinked, and they were gone. The Star Elders said that the thousands of cranes were the spirits of the Atlantean beings that had just been released and were now free. Again the strange dream Aluna had many nights before, "The Born Free" dream, had even a deeper meaning.